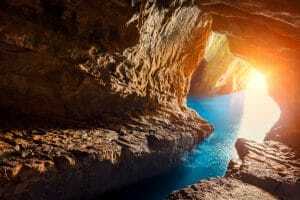 The fascinating tourist attraction of Rosh Hanikra is located at the most north-western corner of Israel,the only point in the country where the sea meets the mountains. A short walk at the heart of the cliff reveals the grottos which are actually marine caves. The grottos were created following a series of subterranean tremors which cracked the rock. Rainwater flowing through these cracks and the gushing sea waves created this natural phenomenon, unique in Israel! Guided tours conducted by Israel Nature and Parks Authority are given every 90 minutes beginning at 11 a.m. on Saturdays and holidays, from Passover to Succoth.Visiting the site is suitable for families of all ages and isrecommended all year round!